The topline numbers in the Brennan poll — 44 percent for keeping the lane as is, 25 percent for making adjustments, and 28 percent for eliminating it — closely resembled the results of the web survey conducted by Brad Lander, Steve Levin, and Community Board 6 last year, which found that 49 percent of Park Slope residents wanted to keep the lane, 22 wanted to keep it and make adjustments, and 29 percent wanted to get rid of it. Earlier this week, Brennan’s office sent around a presentation [PDF], compiled for his office by the polling firm Kiley & Company, which includes the following header summarizing opinion on what should happen next: “After Hearing Arguments on Both Sides, Narrow Majority Favors Changing or Eliminating New Bike Lane.” You can only get to that narrow majority if you group the 25 percent who agreed with the idea of “altering it to address pedestrian and driver concerns” together with the 28 percent who actually want to remove the lane. Despite the fact that his own survey found a substantial margin of support for the PPW redesign, Brennan’s office has been trying to portray those results as a reason to eliminate the bike lane ever since making the poll responses public. But 40% of residents near Prospect Park West, and 42% of older residents, feel less safe as pedestrians crossing or walking along Prospect Park West. This is why I am reluctant to endorse the bike lane as is, and would prefer that the City and the community continue to study the elimination of the two-way lane or the transfer of the bike lane to the righthand side of Prospect Park West with a buffer (an ordinary bike lane). Brennan’s press release didn’t mention anything about the measured reduction in speeding on Prospect Park West or the fact that NYPD reported zero pedestrian injuries after the street was redesigned. Streetsblog sent Brennan a list of questions about his position on the bike lane, how the poll was put together and financed, and why he’s been emphasizing the negative when the topline opinion numbers indicate support for the project. I am posting this statement along with my press release on the poll regarding the bike lanes along Prospect Park. The press release contains lots of information about the poll and a variety of its findings. It contains my position, in that the City should make the bike lane one-way or make it an ordinary bike lane on the right-hand side of the street and maintain the traffic calming measures (two-lanes rather than three). The telephone numbers were drawn from a current data file of all registered voters in zip codes 11215 and 11218. There was no distinction between voting or not voting in any election. Boards of Elections generally make these files available for purchase by the general public. The poll cost $11,000 and was paid for by Friends of Jim Brennan. [Editor’s note: This is Brennan’s campaign fund.] I take full responsibility for all content. Who will run in the next Democratic primary against Jim Brennan? If you are a legitimate candidate with experience working in the community and a good sense of what needs to change in Albany, I will send you $1,000 as soon as you’re campaign committee is set up. I will raise money and volunteer for you also. I will do everything I possibly can to make sure that this tired, out-of-touch, old man is kicked out of his office on 7th Avenue. Jim Brennan was first elected to this office in 1984. 27 years is clearly enough for him. The neighborhood has completely and totally changed all around him. The fact that Jim Brennan wishes to endanger me and my children, that he wishes to subvert a multi-year community process and multiple Community Board votes, and that he is willing to lie about the results of his own telephone survey suggests that Jim Brennan no longer represents the interests of his own district. Please. Someone. Primary this chump. Actually the numbers say that the majority think it stinks the way it is. If you have five minutes free, I would urge you to give a call to Jim Brennan’s office and register your disappointment and disgust. Jim Brennan used to be a pretty straight-shooter. I’m not sure what has happened here. But his willingness to spin his own survey results suggests in such a clearly dishonest way suggests that he can no longer be considered an honest broker in our community. He wants those people to ride on 8th Avenue once, get terrorized, and give up on a bicycle as a form of transportation, as my daughter did. And this does not surprise me one bit. What surprised me is that Brennan took a public stand on anything. Consider all the non-decisions and deals that have been made in Albany over the past 20 years that he has voted for with everyone else. And this is what he feels the need to take a stand on? Don’t remove the bike lane! Remove Jim Brennan! Is there a new pill politicians have been taking that causes them to speak double-talk and confusing, meandering statements when it comes to bike lanes? And more importantly WHO has been handing out the medication? Nobody seems comfortable saying anything positive about bicycling any longer unless there is a qualification FIRST or a horrible mis-statement of a fact or a “I’ve heard from some people they don’t like bike lanes” jab. WTF??? I actually donated a campaign contribution to Mr. Brennan last time around. If I don’t hear something more positive come out of his mouth I’ll be telling all my friends that next time we should find someone else to support. Jim Brennan needs to be invited and show up to the Family Bike Ride on Sunday. Maybe his office will change their mind when they see he will be portrayed as anti-kid and anti-family and anti-safe streets after that visual. There is gonna be a lot of press there. Brad Lander is the only politician I can think of who hasn’t taken this pill. 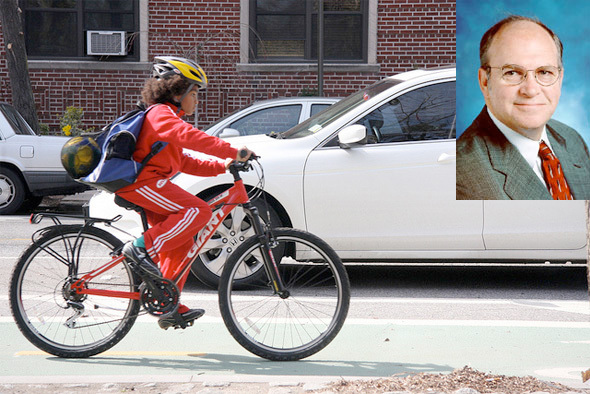 While Schumer and Weiner equivocate, Lander has been clear in his support for safe streets and safety projects like this one. exactly. the Assembly that let congestion pricing die and hundreds of millions in federal money for the city’s transit system evaporate now wants to whittle away “alternative” transportation infrastructure? truly insulting but, unfortunately, not surprising. One of the options that Brennan says he favors is simply making the bike lane one-way. It’s not the ideal solution, but I would be in favor of that if a similar northbound parking-protected bike lane were to be installed on Eighth Avenue. It seems that most politicians have no idea what it is like for a kid to bike to the park in this city. My kids and I love to ride our bikes together in the park. But I absolutely hate the getting to the park part. I feel like my kids lives are constantly in danger every street we ride down and every time we cross an intersection. Protected bike lanes completely change this experience. It is a joy to ride in a protected bike lane. Jim Brennan and other people who oppose safe bike lanes have no idea how hostile they are being. His position is the equivalent of saying that he doesn’t care if my children get hit by a car. It is an absolutely hateful position. 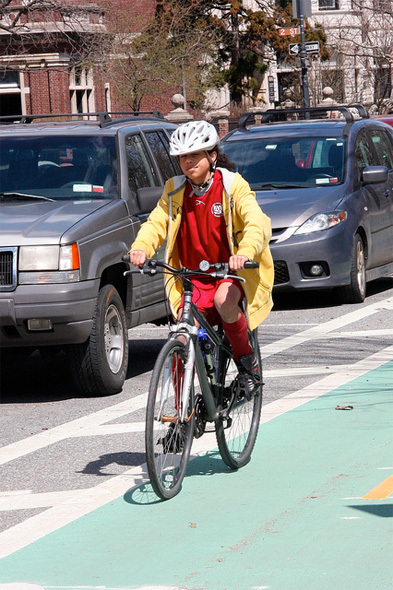 The vast majority of the streets in NYC are not safe for kids. I assume that Jim Brennan just doesn’t get it because I can’t imagine he actually wants kids to die. But he seems to be working very hard to ignore the facts and common sense, and when it comes to the safety of our children, I have very little tolerance for this sort of ignorance and incompetence. And what would the folks on 8th Ave. have to say about it? PPW now has 2 lanes of moving traffic south bound, the same number as 8th Ave. has going north. You could not shoe horn a protected bike lane into 8th Ave. without reducing it from 2 lanes to 1. They are virtually equivalent now. Why change that? That would be absurd. Absurd? Impossible? You guys really lack imagination. Let’s be clear, a one-way bike lane on PPW and a one-way lane on 8th do not equal a two-way lane on PPW. The East side of PPW is an ideal place for a protected lane because it has very few turning conflicts. That means it is better for drivers, pedestrians and cyclists. Drivers do not have to worry about turning into slower cyclists, or worry about the mixture of a slow cyclist waiting for a slower pedestrian crossing in front of them etc. A valid criticism of protected lanes is that cyclists and turning motorists can be surprised by each other. This isn’t a problem on the PPW lane. It defies common sense (and books full of safety data from decades of experience with protected lanes around the world) to want to move a bike lane away from a safe side like the park or the river etc. If curbside parking wasnt a god given entitlement to motordom, we’d have two way protected lanes along every park, cemetary and river in the city. It’s exactly where they should be. What brilliant (low cost) solution do you come up with? 8th Ave. is all of 40 Ft. wide curb to curb. Let’s see, you have 2 lanes of parking at 8′ ea. (that’s 16’) 2 lanes of moving traffic at 11′ ea. min. (+22’ = 38’). That gives about 2 ‘ left over. Not much for a “protected” bike lane. Should we tunnel under or take it out of the sidewalk? Let your imagination run wild. I just stopped by the office and spoke to the woman working there, Ann. She was unaware that Brennan has come out against the bike lane, but when I asked her about the poll results, characterized them as showing “a fairly even division between pros and cons.” She said there were people who liked it, but there was a “slight trend towards asking for alterations” after people heard “pros and cons from the pollster.” She was nice enough to give me a hard copy of the poll results, and direct me to Brennans web site where all the poll questions are posted. She was very courteous and pleasant, and promised that she would pass on my stated support for the lane to Brennan. I asked if he was planning on attending the event on Sunday, and she did not know. I recommend dropping by the office and letting them know if you support the bike lane. She then read to me the press release, which basically said that (no 2 way lane, and no Class 1 lane on PPW). She cites the 42% number of people who say they “FEEL” less safe. I pointed out, that was not borne out by FACTS and EVIDENCE. So the Assemblyman conducts an opinion poll (with probably skewed demographics, the whole ‘land line’ issue), and based on the FEELINGS of a MINORITY of people, he calls for the dismantling of the lane, which has PROVEN to address the issues of speeding and riders on the sidewalk. Like Brooklyn Dad, I urge everyone to call Brennan’s office. I’m not voting for any of these so called “representatives” who insist on blatantly disregarding the overwhelming opinion of their constituents. Total deal-breaker. This is democracy 101. Maybe I’m naive to think they care about votes, or that enough lane supporters will go to the polls, but as long as I’m going to be subjected to Jury Duty, I damn well expect to get some representation out of my voting. In the context of national politics–outside of primaries–your vote has very little meaning in dark red or blue areas like Park Slope or Idaho, so local issues are going to be the main thing motivating my choices. The only way anything more than sharrows would work on 8th Ave is if you either removed a travel lane or a parking lane. If Jim Brennan wants to do this, let him be the one to personally propose it to the residents of Park Slope. He should then be required to attend all CB meetings to personally respond to citizen concerns. We should have two way curb side lanes along most “every park, cemetery and river in the city” and it can be done without even loosing many of those God given parking spaces by moving them to floating parking lanes. I wrote him to ask what criteria he will base his decision – exactly what and how we can convince him to buy the bike lane. I’ll let you know when he answers or when hell freezes over- whichever comes first. I noticed that the Assembly District covering the north end of PPW, belongs to Transportation Committee member Joan Millman. Since Albany seems to be sticking its nose into this, I’d like to know where she stands. Regardless of his position on the bike lane itself, I think Mr. Brennan deserves significant accolades for releasing the detailed outcomes of the survey. A more typical response would be to hide the survey unless its findings clearly supported his position. In other words, most politicians would make their position ahead of time and then release the survey details only if they supported that position. The fact that Mr. Brennan has apparently decided to take a position contrary to public opinion and good government rightly deserves censure, but his courageous decision to release the survey at all deserves at least an equal amount of applause. My opinion is that responsible reporting would mention this act of courage any time his position on the lane itself comes up. Yeah, I love the disingenuous proposals to put a bike lane on 8th. Like that wouldn’t be a total buzz saw. I guess that is the point of suggesting it: it will never happen. Don’t these idiots have anything better to do than fight a bike lane that has reduced speeding and increased safety, especially for children. He released it because, to his way of thinking, it supports his point of view and in that way it could be used to help bolster some very well-connected opposition– and that opposition also supports his point of view. No accolades needed. He’s as “courageous” as Paul Ryan. It’s nearly impossible to get rid of these guys–the Brooklyn machine throws up all sorts of roadblocks. Igor Obermann tried to primary Kruger last time out at a time when Kruger should have been really vulnerable (votes against funding the subways for starters). We even volunteered for him. But he was persuaded to drop out. Maybe you could get somebody from Green party. Working Families party will almost automatically give its line to Brennan–they had ample reason to withhold their line from Cuomo and didn’t. OH Please! There is a two lane street in the park not 20 to 30 feet it’s called West Dr. It runs parrelle and it’s exclusively for bikes, joggers and Ppl If you lived in the area like I do you woudl know that.. What a waste of tax money. If you want to slow traffic just add a speed bumps there are traffic lights every two block at least DOT fixed the traffic pattern so people cannot run the light, that is smart!. All these fanatical bike ppl. Who don’t care if the city cooks the books. And make life easier for them to whiz through 6 month out of the year! You are transparent ! In the 19 blocks between GAP and Bartel Prichard, the loop is accessible at exactly one location! In most cases you can’t GET to the loop without riding for some way on PPW. If the cost is bothering you consider that the city has spent a mere $2M in 4 years to install 255 miles of lanes. The paving budget for one year alone is around $190 M. What’s more, bikes don’t tear up the streets. Cars, trucks, and buses do. Do some research next time. Better yet, since all cyclists are pedestrians sometimes and many of us also drive, perhaps you should jump on a bike sometime and try looking at the world over a set of handle bars for change. How many times do we have to go over this? Wkgreen, we will have to go over this again and again, because people like Paul don’t read anything we write. Thanks for keeping up the fight. I’ll give some credit, but not much. The entire picture includes what they don’t do, in addition what they in fact do. By the non-decision measure, no member of the state legislature should be re-elected. I’m not going to bother responding to this troll’s unimaginative and tired mangling of facts but I would like to ask that he use spell check before posting. And maybe complete his GED English course. Good lord. Progressives are always accused of being elitist but this is the kind of Freeper idiocy that makes it hard not to make fun of them. Maybe if you read something besides the Post and watched something besides Fox I’d take you seriously, dude.